That’s the question being asked by Brooklyn assemblyman and totally reasonable guy Dov Hikind as part of his new #NoNazisInUS initiative. 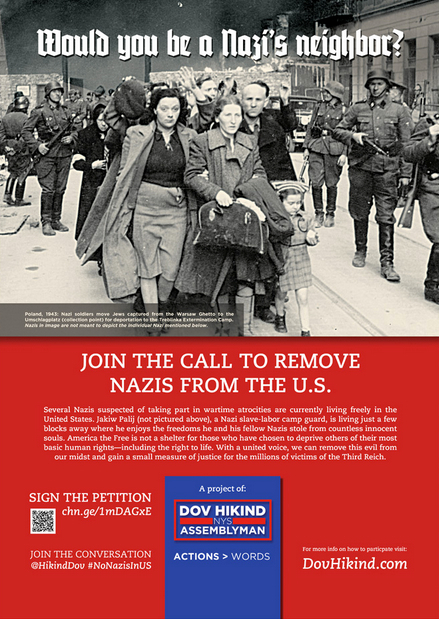 …Nazis who were ordered deported by the U.S. but who have never left the country. The Justice Department’s list includes Theodor Szehinskyj in West Chester, Pennsylvania; John Kalymon in Troy, Michigan; and Jakiw Palij in Queens, New York. That is – an issue which evidently exists outside of Hikind’s jurisdiction by measures of borough, state, and even time-zone boundaries. Never hurts to be too careful.